my friend, riduan wants to rent out his brand new apartment at taman anggerik perdana. 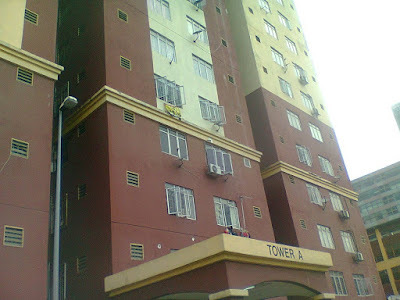 It is a medium cost apartment, kenanga apartment. It has 3 bedroom and 2 bathroom, with one bathroom attached to the master bedroom. The condition is fabulous since it is a new unit, just handed over to the owner. Where is Taman anggerik perdana? it is located at Jalan semenyih, the main road from kajang to Semenyih. Travel from Kajang, u will reach anggerik perdana first before bandar teknologi kajang, then followed by Bandar Sunway Semenyih. It is about 10 minutes to bandar Kajang, 8 minutes to semenyih town, 20 minutes to putrajaya (via kajang silk) and 35 minutes to KL ( kajang silk and PLUS Highway). It also easy accessible to Kajang Silk Highway, PLUS Highway, LDP, and the latest Lekas Highway. Using Silk Highway, u can skip all the traffic jam at Kajang town. The apartment is near to primary school, technical secondary school and government clinic. Rental asking price is RM 400. Facing to the scenery of Bandar Teknologi Kajang, u can clearly see the primary school in front.